Wassily Kandinsky, Kazimir Malevich, Joan Miro, Bram van Velde, Sam Gilliam, Adolph Gottlieb, Robert Motherwell, Pierre Tal-Coat, Antoni Tapies, Howard Hodgkin, Manel Lledos, and Andre Ferrella, and featuring new paintings on paper by Jonna Rae Brinkman and a new 63-color screenprint by Helen Frankenthaler. Spaightwood Galleries announces the extension of its current show, Abstract Art from Kandinsky to the Present, featuring works by Wassily Kandinsky, Kazimir Malevich, Joan Miró, Bram van Velde, Adolph Gottlieb, Robert Motherwell, Pierre Tal-Coat, Antoni Tapies, Howard Hodgkin, Manel Lledos, André Ferrella, and Steven Hickey, and featuring new paintings on paper by Jonna Rae Brinkman and a new 63-color screenprint by Helen Frankenthaler. 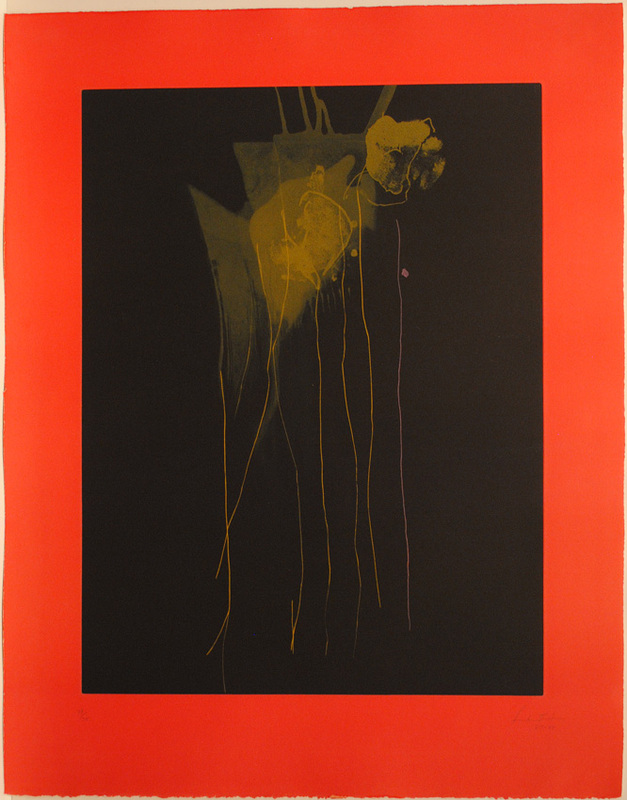 The show visually suggests that all abstract art is not alike nor is it motivated by similar conceptions on the part of its makers, ranging from the deeply spiritual abstraction of Kandinsky, Miró, and Gottlieb, the geometric abstraction of Malevich, the expressionist and existentialist abstraction of Van Velde and Hickey, the lyrical abstraction of Tal-Coat, Frankenthaler, and Hodgkin, the gesturalist abstraction of Motherwell, Tàpies, Lledos, and Brinkman, and the phantasmagorical living-mold photographic abstractions of Ferrella. In a departure from recent shows, we focus on groups of works by some of the most important abstract artists of the twentieth century, each of whom came to prominence in a different decade, Kandinsky and Malevich in the teens, Miro in the twenties, Bram Van Velde in the thirties, Tal-Coat in the forties, Motherwell and Gottlieb in the fifties, Tapies in the sixties, Frankenthaler in the seventies, Hodgkin in the eighties, and Lledos in the nineties. We also present works from three artists at different stages in establishing themselves. Steven Hickey, son of the sculptor Rose van Vranken, is having his works shown in a commercial gallery for the first time; Jonna Rae Brinkman has been showing at Spaightwood since 1998 and in that brief time has won quite a considerable following and been the subject of a feature in The Wisconsin State Journal by John Aehl; and André Ferrella, whose work has been seen in Madison at the most recent Wisconsin Triennial and at the Promega Gallery, appears on the point of emerging as an artist of international stature and the subject of a prime-time television documentary to be shown in Germany, site of a number of recent important exhibitions of his work, and France. Ferrella is also about to be featured in a major show at the Toledo Museum of Art. The Helen Frankenthaler screenprint, Grey Fireworks, has arrived and we have sold all but one of our four impressions. 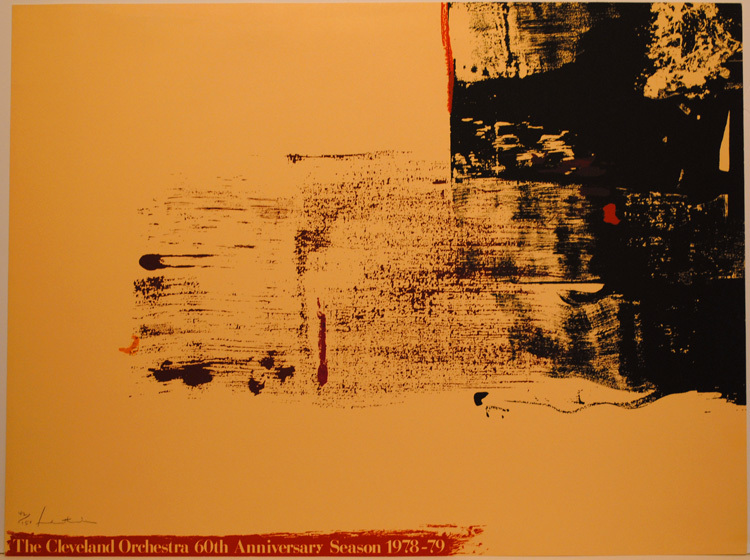 Frankenthaler produced this image for Lincoln Center in an edition of 108 signed and numbered impressions (plus 18 artists proofs). Tom Lollar, head of the Lincoln Center Print and Poster Program, has described this as the most gorgeous of the three prints she had done for them up tp that time. Grey Fireworks is a 63-color screenprint published in an edition of 108 signed and numbered impressions. The image is 710x1168mm (or 28"x46" inches; we’re going to mat the impression that we show in a 36"x52" mat); it could be framed without a mat using spacers, depending upon how much space is available to hold it. Lincoln Center was sold out before the publication date, over 80 dealers are in a fury because they did not get a chance to get one, and the wholesale bidding price is up $1000 over three weeks ago. When we first offered the work, we expected the price to rise rapidly, but we underestimated how rapidly it would rise. The highest price we have seen it advertised at is $8000, but we suspect that it will rise further. We priced ours at $4950 and sold it immediately. We think the price will be rising still further in the weeks and months to come; if you have an interest in this beautiful piece, call now; we plan to sell only one more impression in the forseeable future. Unlike commercial screenprints, which tend to be based upon photographs, an artist’s screenprint (for want of a better term) is not a mass-produced photographic reproduction: each color is hand-printed in a separate press run. The screens can be hand-painted, stenciled on, or an image can be laid on the screen photographically. 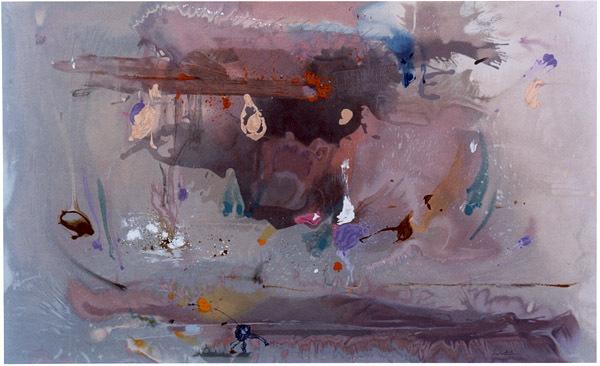 Once the screens are done, ink is forced through the screens onto the paper using a squeegee or vacuum press (for glopping lots of ink through; screenprints by Sam Gilliam or Bill Weege often have the surface texture of oil paintings; Frankenthaler’s tend to be two-dimensional, like Titus-Carmel’s). Normally, after each color is run, the paper is put in a rack until the paper and ink are dry enough for the next color run. Although this work is based upon a painting of the same title, all of the screens were prepared by hand under Frankenthaler’s direction. 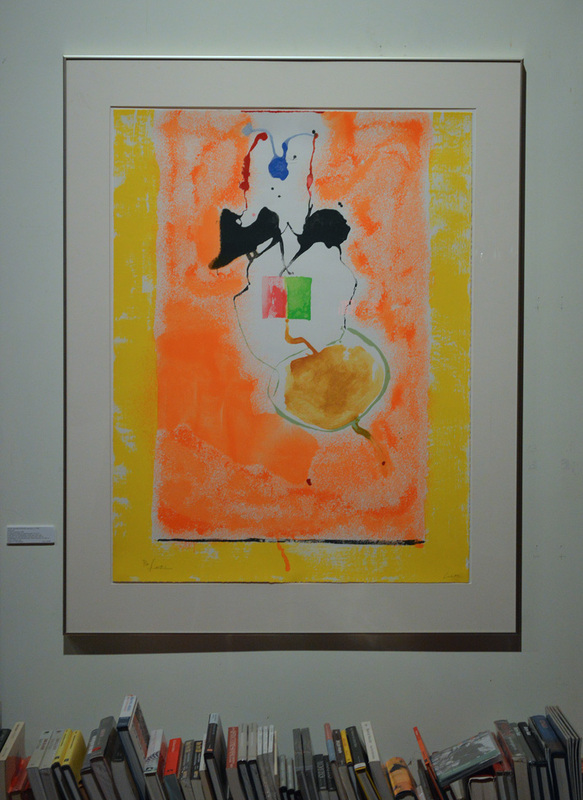 Frankenthaler screenprints tend to sell for about the same amount as her lithographs (prices run from about $3500 to $10, 000 depending upon size and complexity; this one is quite large and very complex). Her etchings cost more (the one we have, Plaza Real, which was included in the National Gallery of Art’s Frankenthaler Print Retrospective, costs $14,250) and her woodcuts tend to sell in the $50,00090,000 range. Update 2005: We are sold out of all the signed Grey Fireworks, but still available is the unsigned poster version made from the same screens at the same time by Lincoln Center's printer. Edition: c. 800 posters with lettering, of which about 300 were used by Lincoln Center for display at the time. Image size: 710x1168mm (28"x46"). Price: $1000.